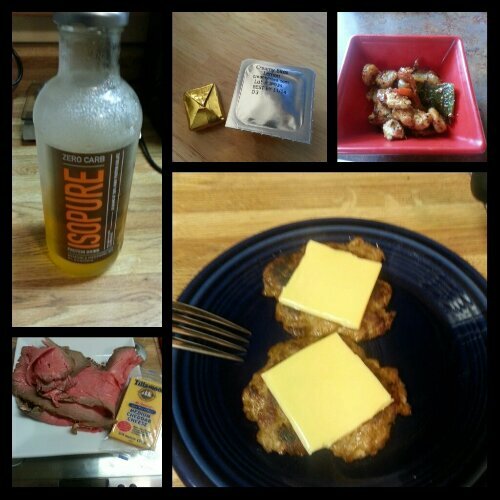 Today’s food choices, from upper right: part of a jambalaya bowl from Genghis Grill (chicken breast, shrimp, onions, bell peppers, minced garlic in a roasted tomato sauce); homemade maple chipotle pork sausage patties with a 2% milk Kraft Singles slice; the most perfect roast beef slices with a Tillamook cheese snack; Isopure Zero Carb; multivitamin and calcium supplements x2. Seriously, that roast beef could not have been cooked more perfectly. It was nice and pink in the center, and when I saw it in the case at the store, I knew I had to have it and that it would be dinner tonight. So instead of my jambalaya bowl leftovers, I had a little shy of 3 ounces of the most perfectly cooked rare roast beef and a piece of cheese for dinner. SO GOOD. I don’t eat red meat very often, but when I do, I make sure it is quality stuff! Good thing that happened today: I think I figured out the optimum time to grocery shop. If I go to Central Market around 7 pm on a Saturday night, I avoid the sampling that tends to take place on Sunday afternoons. This may be my new default grocery shopping time because it helps me avoid mindless eating that goes on when I stop and get samples. And it gives me one less thing to do on Sunday afternoons so I can enjoy my last weekend day before the week starts up all over again. Shifting gears entirely…I don’t feel good about this week. And I know precisely why. I am now on the downward slide of my hormone cycle, sliding toward Aunt Flo’s visit in a couple of weeks. It is during this time of the month that I retain water like the Titanic, so no matter what effort I may make to lose weight, I never do. Stupid hormones. Knowing this, I have to steel myself for the possibility that the scale will show either no change, or a positive change in my weight. My walking this week has been really good (7500 steps+ nearly every single day), my eating has been good (800-900 calories daily, 70+ grams protein daily, less than 50 grams carbs daily) and I’ve been getting roughly 6.5 hours of sleep each night (I need more, I know). Despite all these things, I feel in my gut (ha!) that I’m going to see a gain this week. I know this is a natural part of the process of weight loss, but that doesn’t mean I have to like it. Each meal (breakfast, lunch, dinner) should be at least 18+ grams of protein if possible and fewer than 200 calories. Snacks should be limited to 150-200 calories total. I need to ditch my calcium supplement. As delicious as it is, it is 70 calories out of each day. If I can take Caltrate Petites instead, that may be the way to go. I just need to see if they’re small enough for me to swallow. I need to aim for 80 grams protein or more. Because I want to boost my protein intake, this may require me to start supplementing with Isopure Zero Carb. Not what I really want to do, but if I’m going to get the most bang for my nutritional buck, this is what I have to do. I may mix up a bottle of half Isopure, half water and take it to school each morning and drink it once I’m able to start sipping on water after breakfast. I typically wait about 45 minutes after a meal to start drinking fluids again, and I could sip on protein-laced water until lunchtime, which would eliminate the need for a mid-morning snack. I’m going to give it a try this week to see what happens. I’m also going to make sure I can get in my 7500 steps every day this week, come hell or high water. Thankfully the weather is cooling off, so going for walks outside will start to become an attractive option. Mini Cheesy Barbecue Meatloaves: This is my recipe. I’m tweaking it slightly by using 99% lean ground turkey instead of ground sirloin, and subbing in onions for the celery (I’m not sure I can do celery just yet; I’ve been somewhat cautious in introducing certain veggies back into my diet). I still need to run the nutritional information on it in MyFitnessPal, but I think using the turkey will boost the protein content quite a bit. I think I will make these in cupcake liners for portion control. I also have mini loaf pans but I think the miniloaves will still be too much for me to eat at once, so making them in cupcake liners may be a better choice. Petite Lasagnas: I’m modifying this recipe a bit by making homemade Italian sausage from lean ground pork, ground fennel, paprika, and red pepper flakes. I’m also leaving out the ricotta and multiple layers of wonton wrappers. I’m planning on just using two wrappers, and having the filling be the sausage blended with marinara and a mixture of basil, garlic, mozzarella and Pecorino Romano cheeses. This week’s veggie of choice will be steamed broccoli. I have a bag in the freezer that needs to be eaten so I’m going to chip away at that this week an ounce at a time. 🙂 And I dig broccoli, so this is a bonus! Well, I guess I’ll see what the scale tells me tomorrow. I do plan on taking measurements tomorrow as well since it is pretty close to time for that anyway, so hopefully if the scale doesn’t give me good news, the measuring tape will. This entry was posted in daily bites, eating, fighting biology, la guerra, meal planning, post-op, the body is a funny thing, vsg, weight loss surgery and tagged daily bites, fighting biology, meal planning, post-op eating, post-op life, she's got skillz, stupid hormones, VSG, vsg realness, WLS. Bookmark the permalink.